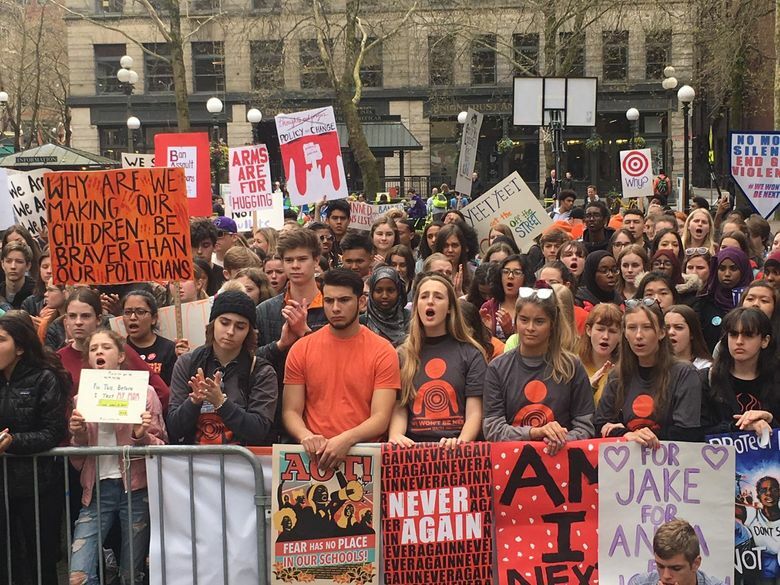 Students from schools across the region rallied in Seattle on Friday to call attention to gun violence and for stricter gun laws. 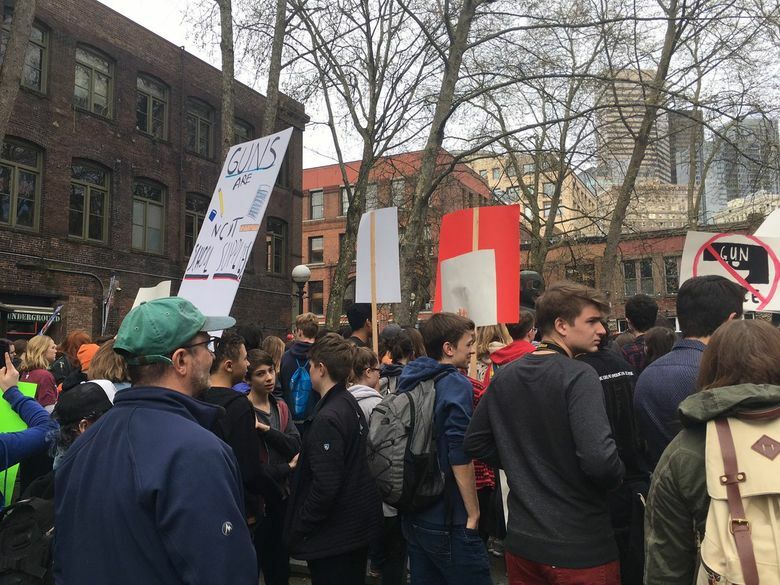 Hundreds of students gathered at Seattle’s Occidental Park for the “We Won’t Be Next” rally Friday afternoon to call attention to gun violence that occurs outside of schools — and to call for stricter gun laws to prevent gun violence everywhere. 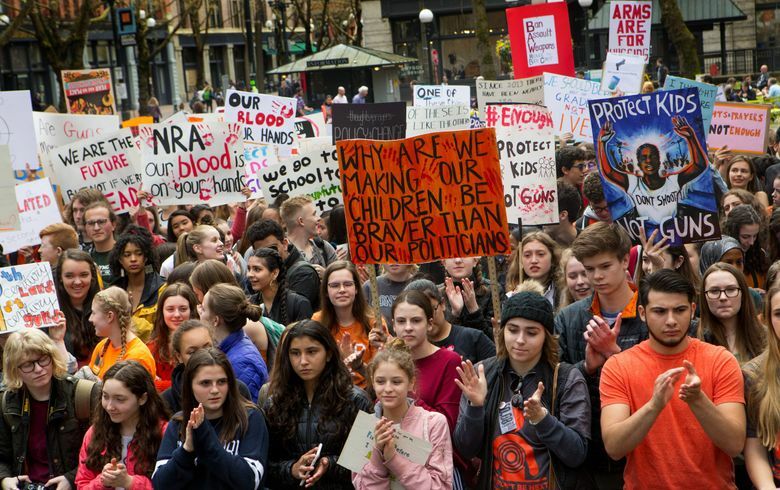 Students, many of them wearing orange to show support for the anti-gun-violence movement, spoke about the need for what they described as “common-sense gun laws.” Their goals include raising the age to 21 for buying all semi-automatic firearms and assault-style weapons, requiring a safety course to purchase a firearm and a ban on bump stocks nationwide. Between speeches and musical performances, one student organizer made an announcement: The Alliance for Gun Responsibility on Friday has proposed a 2018 ballot initiative that addresses many of their goals. The proposed initiative raises the purchase age to 21 for semi-automatic weapons, requires an enhanced background check system similar to the requirement to purchase a handgun, requires buyers take a firearm safety training course and creates standards for secure weapon storage. 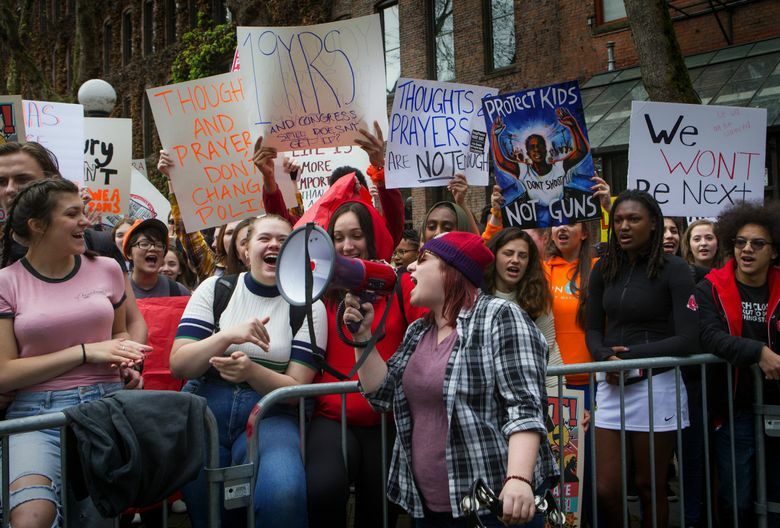 The announcement was met with loud cheers from the students, many of whom had staged walkouts Friday morning at their schools. Battle jokingly gave a shout out “to those who face detention or Saturday school” for leaving classes early. 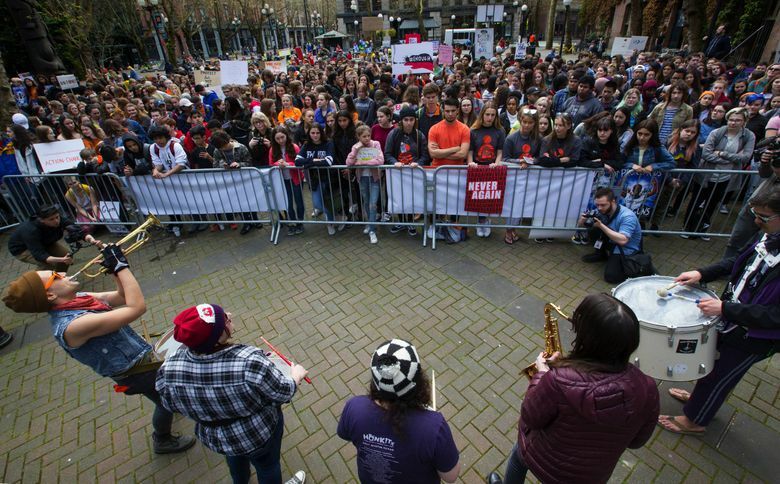 The “We Won’t Be Next” rally coincides with the National School Walkout, protests held to mark the 19th anniversary of the Columbine shooting. 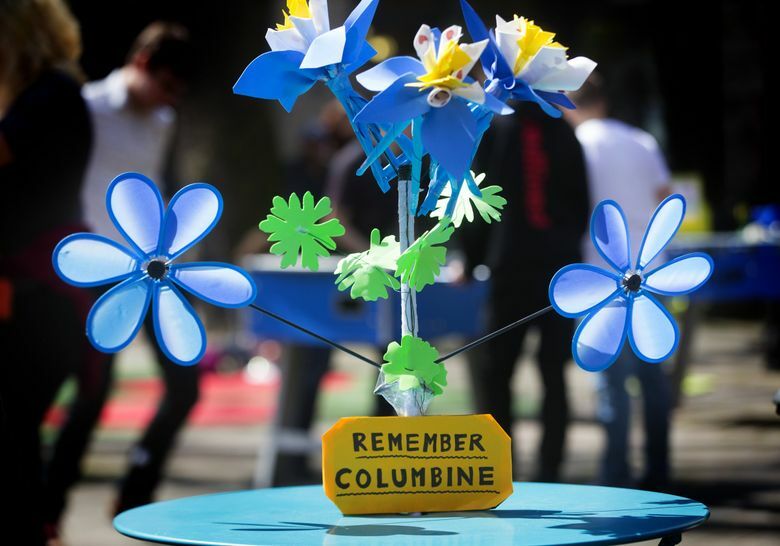 On April 20, 1999, 13 students and teachers were killed at their Littleton, Colo., school by two shooters, who then turned the guns on themselves. It was the deadliest high-school shooting in U.S. history until the February shooting at a high school in Parkland, Florida, which left 17 people dead. Since Parkland, students have staged walkouts and participated in the March For Our Lives, which brought out thousands of people across the nation. 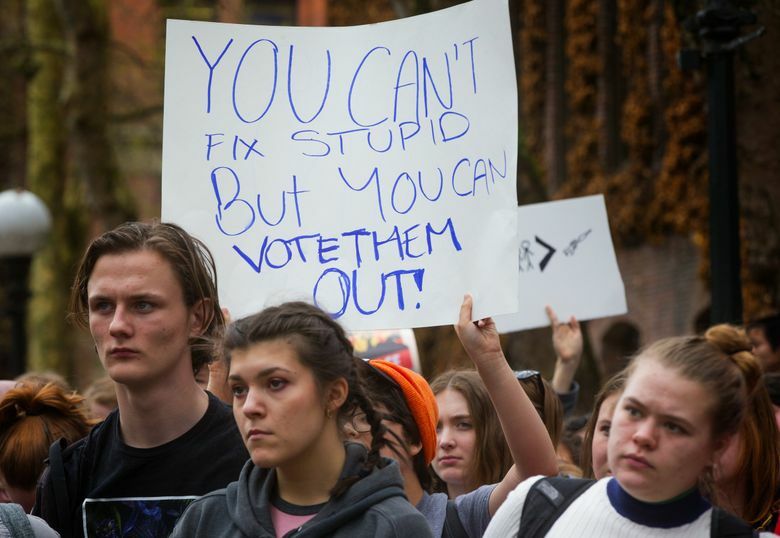 Friday’s rally showed that the momentum from those events continues, said Max Weber, a student at Bainbridge Island High School. The rally also included a question-and-answer session with Sen. Rebecca Saldana, D-Seattle, Sen. Marko Liias, D-Mukilteo, University of Washington Bothell student and activist Zarefah Baroud and Karyn Brownson, community safety manager for Public Health – Seattle & King County. One student asked how she can help prevent gun violence when she’s too young to drive and too young to vote. 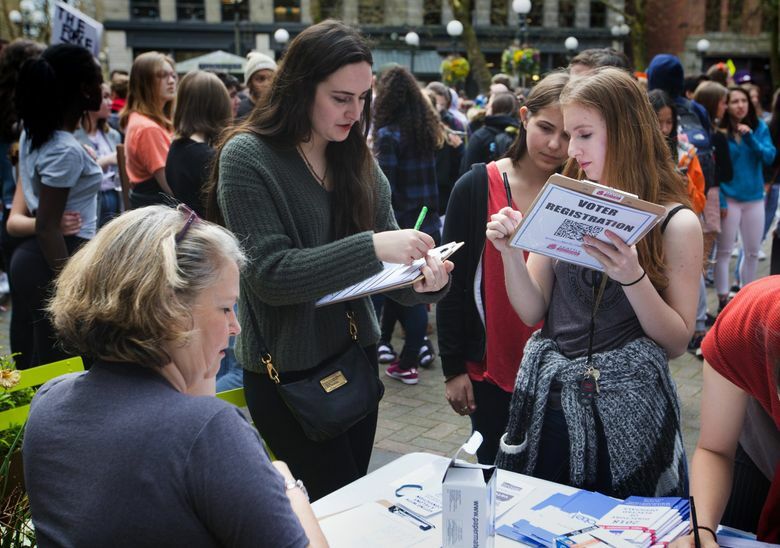 Liias encouraged her to register to vote at 16, and — noting that many gun deaths in Washington are from suicide — help create a positive environment for family members or friends who might be struggling. “All of us are part of that solution, whether you’re 14 or 44,” he said.